False eyelashes are some of the most popular aesthetic additives in the face these days. These are used to make the eyelashes look longer. A lot of women feel much more attractive if they are wearing long lashes because it adds depth to their eyes and femininity to their overall appearance. But one thing that you should never forget when you’re wearing false eyelashes is false eyelash glue. Eyelash glue is often included in a package of false eyelashes. These usually come in tubes just like ordinary glue products. But these are made to be nontoxic because they are used in the eyelid area very near the eyes. If eyelash glue isn’t nontoxic, it can have very bad effects on the eyes. It can cause allergic reactions, irritation to the eyelids, and you may even go blind if you use the glue incorrectly. 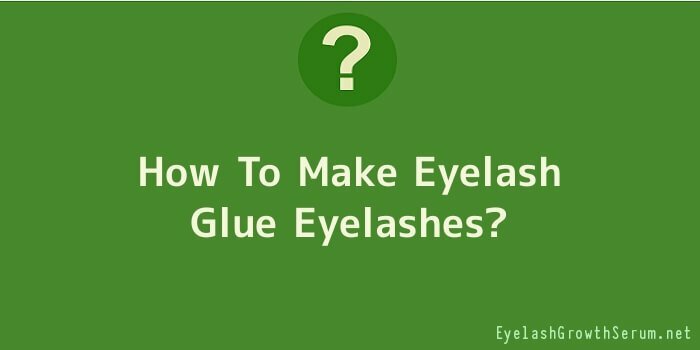 This is why some people prefer to make their own homemade eyelash glue because they feel that if they know what’s in the glue, they would be more secure about using the glue. Homemade eyelash glue isn’t hard to make. However, there are many different variations in the process of making this kind of glue. The cooking process is basically the same, though. Most of the time, the ingredients are the only variable factors. However, there are many differences in the specific cooking process if the ingredients change. Here are two different methods of making eyelash glue. Get a small cup and a teaspoon. Make sure that these are all clean. Collect all of the ingredients in the following proportions: ½ teaspoon of sugar, one drop of honey, 3 tablespoons of water, and one drop of nontoxic white glue. Combine all of the ingredients in the cup and stir them to mix them all together. The sugar should be completely dissolved in the mixture. Let the mixture settle for a while. This will allow the sugar to dissolve better. After several minutes to an hour, you can mix the concoction again to see if it has completely liquefied. Keep this mixture in a safe, cool, and dry place, but not in the refrigerator. Ingredients: tap water, cold water, cornstarch corn syrup, vinegar. Get a small saucepan and a small bowl. The bowl will be used for mixing the ingredients while the saucepan will be used for cooking the glue. Collect all of the ingredients in the following proportions: ¾ cup water, 2 tablespoons corn syrup, 1 teaspoon white vinegar, 2 tablespoons cornstarch, ¾ cup cold water. Combine the tap water, corn syrup, and vinegar in the saucepan. Turn on the fire and bring the mixture to a boil while stirring. In a separate bowl, combine the cold water and the cornstarch. Make sure to dissolve the cornstarch in the cold water completely. Slowly add the cornstarch mixture in the boiling saucepan mixture. Stir the mixture continuously until it boils again. Boil for a minute and then turn off the fire. Keep the mixture in a clean container and store it in a cool, dry place, but not in the refrigerator. You may test your eyelash glue by dipping a cotton swab in the glue and applying an adequate amount of glue on the side of the false lashes which will be stuck onto the eyelid. After applying, stick the lashes to the eyelid and let it stay on for a few minutes to dry. Afterwards, try moving around and walking to see if the glue has a good hold. If it stays on, then you’ve successfully made your own eyelash glue.